One of the many things I’ve learned during my time as a golf course superintendent, is sometimes its best to let the golf course speak for itself-speak for itself it has. I’m very proud of the golf course this season, especially in what until about two weeks ago had been a difficult season for managing high performing turf. Numerous colleagues in the Upper-Midwest have struggled with abiotic stress this summer. The nature of the spring-very cold, with an exceptionally quick and persistent warm-up, didn’t allow our turf to gain the type of strength it typically does in the spring of the year. Root growth was limited, which left plants more susceptible to stress from the heat and humidity of June and early July. This abiotic stress is most notable in high-traffic areas of our collars. Nonetheless, as the weather has cooled, and humidity lowered the past couple of weeks, you will note these areas have begun to improve. The odd spring weather has also made this a great summer for weeds. This is very notable on the hillside left of 16 tee. Two factors have led to the greater number of weeds; 1) the lack of spring rain did not allow our pre-emergent herbicide application to be watered in properly. As this area is unirrigated, rainfall was required, and it didn’t come in a timely manner. 2) The fescue was exposed to very cold winds this winter. While it survived, its early season growth was slow, giving an opportunity to the weeds. None of this is an unsolvable problem. Weeds have been sprayed and mowing this fall will help to control any kind of takeover by undesirable material. I visited another local private club this weekend and their superintendent and I had a conversation about this. Their fescue areas have not been at their best this year either. The hillside on 16 is an ecosystem subject the weather and almost certain to vary from year to year. One plant we have not sprayed on this hillside is the milkweed. Milkweed is a plant very beneficial to pollinators of all sorts, particularly monarch butterflies. Creating pollinator friendly habitat is something I’m passionate about, thus we allow the milkweed to persist. 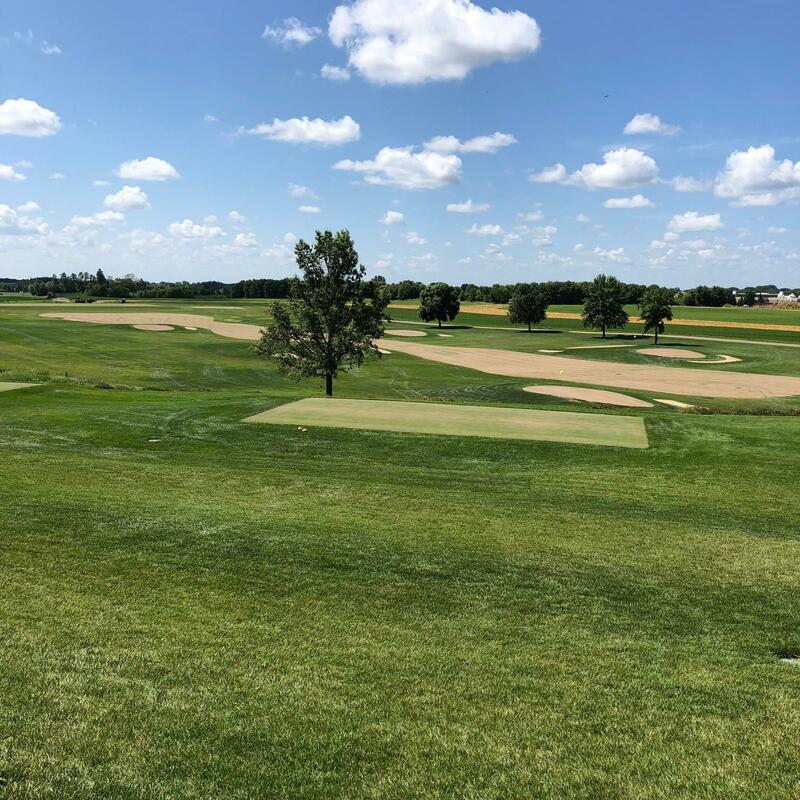 To have the black tees open for play in a timely manner, we stripped sod from what are essentially unused (most of the time) championship tees. These tees were seeded, and we almost immediately receive a heavy 1.5” of rain. A couple of the tees are moving along nicely, others are not and will be re-seeded soon. The construction from this spring has matured very nicely and will continue to do so as we move into the fall. Sodded areas, especially those done in the spring, never reach their full potential until the following season. For evidence of this, look no further than the area between the clubhouse and 9 and 18 green. Sodded last spring, this area needed a lot of attention during last season. Cart signs, rope and stake were a constant eyesore throughout, but this year the area is spectacular and free of any type of intervention from signs. Next season I expect to see the same improvement in the areas in which we performed construction this spring. The golf course will be topdressed and aerified this week. 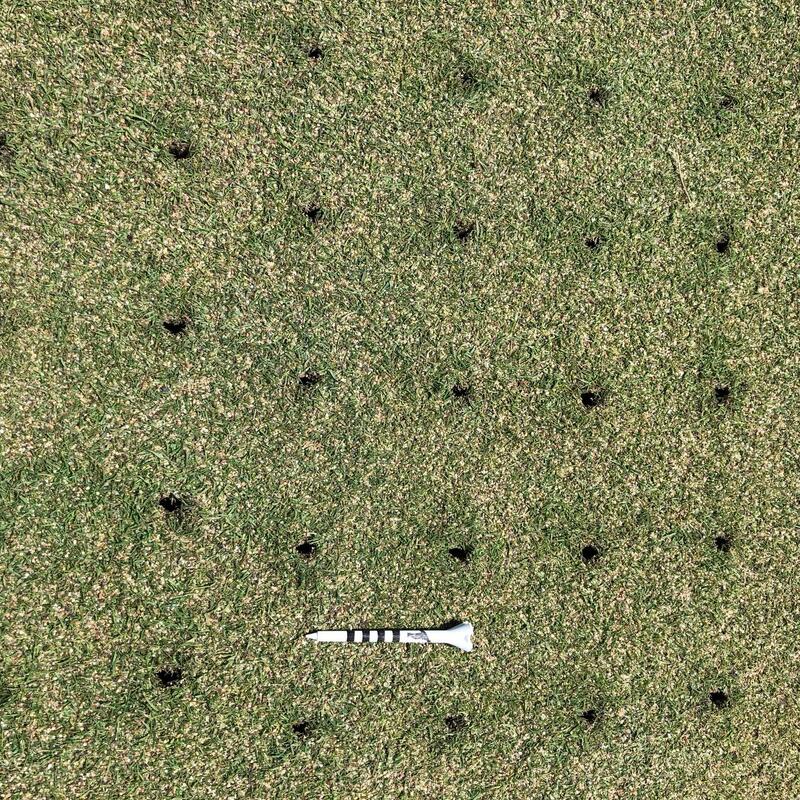 This will be a gentle solid-tine aerification, coupled with a normal amount of topdressing, the results of which will not impact play for much longer than a week.